DVDs of Fr. Roy Bourgeois's lecture available soon! Roy Bourgeois is a Maryknoll priest, human rights activist, & outspoken advocate for women's ordination. He has been fighting for two decades to close the U.S. Army School of the Americas at Fort Benning, Ga., which trains Latin American soldiers, many of whom have committed human rights abuses in their home countries. He leads an annual vigil outside Fort Benning that attracts thousands who want to see the operation shut down. In recent years, he is one of the few priests willing to speak publicly about women's ordination, and in 2008 took part in the ordination of a woman. Fr. Roy will speak about "A New Model of Being Church", part of the “Shatter the Stained Glass Ceiling Tour” sponsored by Call To Action and the Women's Ordination Conference. The Vatican had proclaimed 2009-10 as The Year of the Priest. In recognition of this, The Epiphany Group is presenting two workshops, free and open to the public, leading up to Fr. Roy’s talk on women’s ordination. Both workshops will be at the Hardesty Library. A slide presentation of art from catacomb frescos, paintings, and mosaics which depict the role of women in early church leadership. The presentation is researched and designed by Sister Christina Schenk CSJ and is provided by FutureChurch. Susan Murphy of the Epiphany Group will lead the discussion. Susan holds an M.A. in Pastoral Ministry from the Aquinas Institute of Theology. She has spent the last 15 years working with physically and sexually abused women and co-founded a non-profit organization with The Community of St. James to help impoverished women become economically independent. Susan is also an artist who works with paint and clay to tell the stories of biblical women. Mother Andrea Jones, an Episcopal priest, will speak on her experiences as an ordained woman in a traditionally male-dominated clergy. 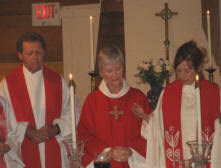 Ordained in 2000, she currently is Asst. to the Rector at St. Luke’s Episcopal Church in Bartlesville. She previously served as a priest in parishes in Fremont, Nebraska, Sand Springs, and Miami, Oklahoma. As part of her presentation, Mthr. Jones will be open to questions from the audience.